Technology gave us everything we wanted, from i-pads to cars, from spaceships to robots, everything that can help us. In this tech world, everything gets done very easily, we can control almost everything. But, even today, when technology brought us such comfort and extravagant lifestyle, it also made way for a lot of problems. Today, humans are more vulnerable than ever before. We are stuck with our nine to five jobs, we do not have enough time to relax, and are just running behind money and materialistic happiness. Thus, we are creating so many problems for ourselves. And we cannot even rely on technology to solve these problems for us. To solve these problems or to get out of these unwanted situations, we must follow the old trusted ways. Traditional methods like a clairvoyant Reading can really help us to identify the problem and then to solve it here is some help on what to say on your call. Clairvoyant Reading is a trusted psychic method to solve problems. Clairvoyant readers at Psych-Hub UK are psychic experts who can see beyond this time and dimension. With their extraordinary vision, they can understand our problems and help us to tackle them in a much better way. All your concerns about future can get solved by this excellent method. Our psychic experts are very experienced in Clairvoyant Readings and they will give you proper advice so that you can eliminate those problems. You could reach out to us anytime you want, as we provide Clairvoyant Reading over phone twenty four hours a day. It does not matter if it is really late at night or early in the morning; our clairvoyant readers are always there to help you. Our first priority is customer satisfaction and we work really hard to provide you the best solution. Just contact us to know more about Clairvoyant Phone Reading. We all have different talents. Maybe, someone is good at singing, some good at dancing and others at solving very hard mathematical problems. Similarly, our psychic experts have the talent to identify your true problems. Clairvoyant readers can look into your past to understand your problems which is one of the major advantages of consulting a clairvoyant reader. A Clairvoyant Reading depends on three–time phases of human life- past, present, and future. After knowing about your past, our psychic readers will evaluate your present situation and then they will tell you what you should do to improve the present scenario. We face so many tough situations in life…so many problems….and sometimes it is not possible for us to share those issues with a known person. Our close ones are precious to us; we cannot take any risk by disclosing our major issues to them as we may lose them. That is why our psychic reading experts are there to help you out of this tricky situation. All of us have faced this situation in life when we are about to take a very important life decision but we are not sure which one is the right option. It is just like standing in front of two roads, and not knowing which way to go. You can only take the right decision if you can see the future, which is not possible for normal people. But, our Clairvoyant Reading experts can see much beyond normal human eyes and thus, can guide you to take the right decision or to choose the appropriate path for you. Contact our psychic experts and discuss your problems and you will surely find a solution to eliminate all your troubles. In today’s world, it is not that easy to maintain a healthy relationship with your partner. There are so many distractions present and misunderstandings can ruin your long–term relationship in just a few hours. So, to understand your loved ones and to treat them in a better way, you should definitely contact our Clairvoyant Reading experts. You can talk freely about your relationship, problems that you are facing with your partner and even about a third person who is trying to ruin your relationship. Our psychic experts are always there to solve all your issues. the long lost peace in your family life. If you want to talk about your family issues or maybe some specific problem regarding one of your family members, then you should definitely use our Clairvoyant Phone Reading facility. The market is going through an evolution these days and it is really hard for the businessmen to keep up with the ongoing development of both technical and management fields. It is not easy to take bold decisions in business as it may lead to an unwanted situation. So, before taking any important decision, you can easily contact our psychic experts and they will tell you what you should do. It helps you to take the right decisions in life. You can discuss various problems with our clairvoyant readers. The call rates are really less compared to other online services that we use. Our clairvoyant readers are very experienced, as they have mastered various psychic techniques to solve different problems. 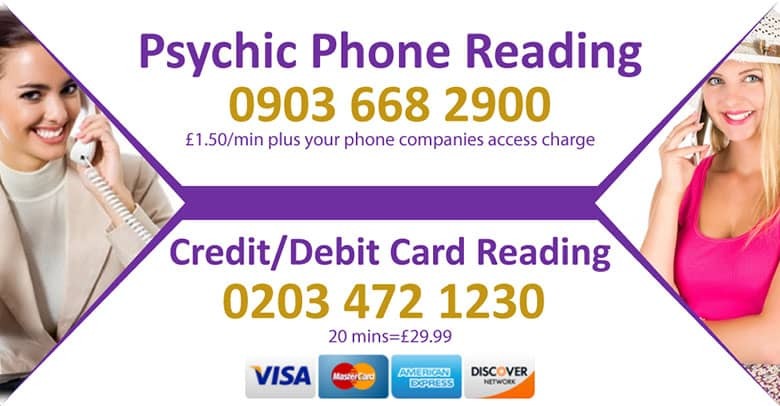 We provide you the best Clairvoyant Phone Psychic UK Reading facility in the entire the United Kingdom. Know about your future from our expert clairvoyant readers and take the right decision. Clairvoyant Reading is a traditional way, which is used for decades, by the experts to solve the necessary problems. What is a clairvoyant and do a need to book prior? A clairvoyant is someone who can read your future present and past and be in touch with spirits who surround your life. They also have the ability to do tarot card readings and have the powers to predict your future with accuracy. A clairvoyant is quite different to a medium or psychic and poses a totally different skill set in many ways. People often get them confused with fortune tellers and in the past have been referred to as crystal ball glazzers and other nicknames that float around in the UK. If you have never tried these types of supernatural services we offer many different avenues of introducing a whole new approach to your spiritual healing and we are more than happy to explain what we do briefly at no cost to you the consumer. So pick up the telephone and call Psch-Hub today.